• check interior light and stop unwanted air leaks. 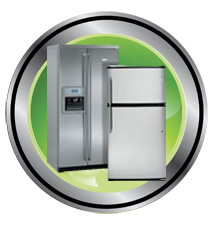 • install new ice-makers into your existing refrigerator/freezer unit. Most times replacing a component part is all you need to extend the life of your appliance. Don’t spend money on a new refrigerator – we can fix it and get you back to working order. Our goal is your satisfaction! Give us a call at 816.286.4445 or 877.983.4933 x7.